...great-great-great-great-great cousin Henry the 8th? It is no secret that the men in the Royal Family have a right royal history of having mistresses...but what I just heard (if it is true) really takes the biscuit for naughty depravity. And that is that Henry the 8th not only married Anne Boleyn but first also enjoyed a long bit of slap and tickle with Anne Boleyn's mother! Now I realise that things were different back in those days and a bit of royal randyness might not have raised more than just an eyebrow but, but, but...mother and daughter?. Is it really true that Henry the 8th had a torrid affair with Anne Boleyn's mother as his mistress? 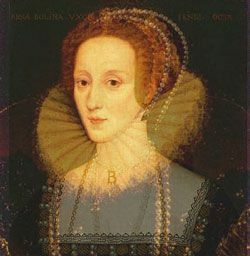 Anne Boleyn's mother, Elizabeth Boleyn, Countess of Wiltshire. What is a "great cousin"? Easy one, Siasl. A great cousin is a cousin several generations back. And Henry the 8th (judging from his size in XL corsets) is a truly 'great' cousin in all respects. But the question is: Did fatso Henry the 8th also really have an affair with Anne Boleyn's mum Elizabeth before turning his attentions on her young daughter, Anne Boleyn? Is it true? Or is it a lie? So, "great cousin" is "cousin n-times removed", where "n" is the number of "greats". Still, the rumour persists despite Henry's denial, but it may be that folks are confusing her with Elizabeth Blount, who he did dabble with. He did have an affair with Anne's sister Mary, though. Wasn't Henry the 8th a busy lad! Bumping Anne Boleyn, flattening her sister Mary and dallying with Elizabeth Blount. It beats how he ever found time to battle with the Pope, kick off the Reformation, set up the Church of England and deny writing 'Gleensleeves'.